Features: 24 oz. Capacity. Durable Tritan Material. Screw-Off Lid. Top Doubles as Cup. Loop Handle. BPA-Free. Full color imprint available on top for extra charge (call or chat for pricing). 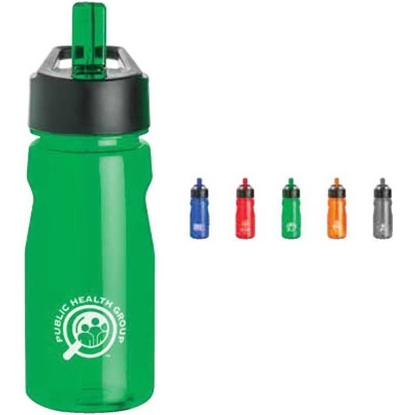 Attach this bottle to their attire and your logo and you've got a winning promo! Our BPA-free, shatter-resistant 18 oz. 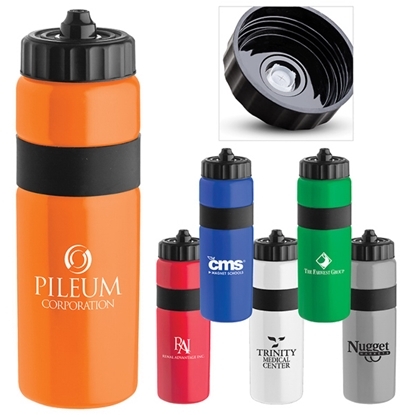 Tritan (TM) notched water bottle with loop measures 7 1/2" H x 3 1/2" diameter. 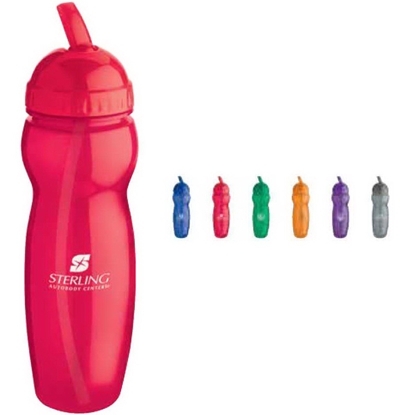 It features translucent colors, notched design for easy grip, twist-on black plastic lid with matching color pull-up spout (straw inside), and built-in loop. Dishwasher safe. 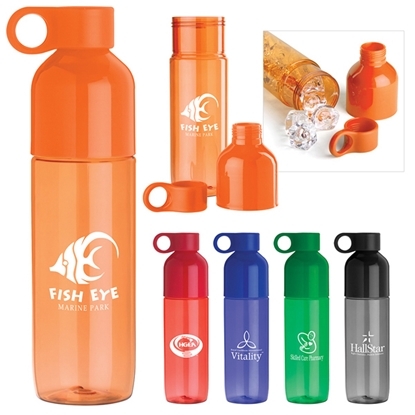 Have your logo silkscreened on this eco-friendly item. Ideal for athletic leagues, universities and community programs. 30 oz. 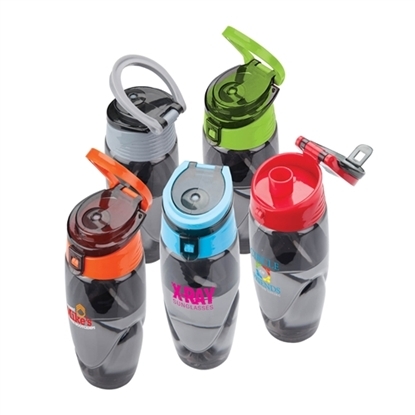 mega capacity Tritan (TM) fitness water bottle. Silicone grip on twist-on lid for easy opening. Large loop handle for carrying or attaching keys. Includes built-in storage compartment in lid for supplements or keys. BPA free. Perfect for the gym! Item size: 10"H x 3" Dia. Ride a wave of promotional success with a cheery summer giveaway! Our 25 oz. 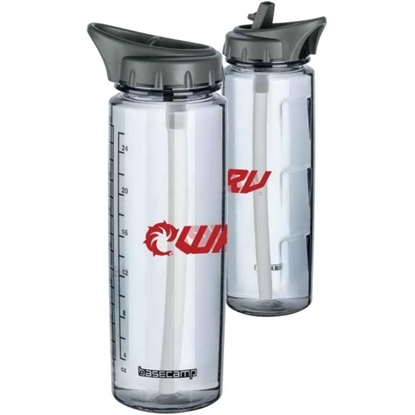 shatter-resistant Clear Wave Water Bottle is made of crystal clear Eastman Tritan (TM) material, featuring a beautiful bold color wave graphic, matching twist-on lid with pull-up spout and built-in loop. 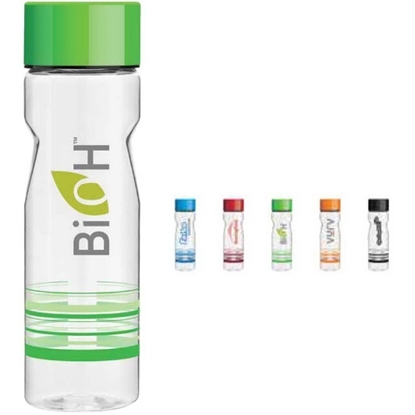 At 9 3/4" H x 3" Diameter, it's eco-friendly and BPA free. Ideal for festivals, universities and community programs. Your silkscreened logo shows up prominently on the wavy surface! It's the classic winning formula of athlete, water bottle and your brand! Our BPA-free, 22 oz. 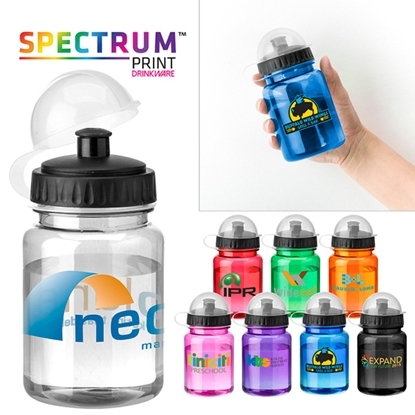 Translucent Water Bottle measures 9 3/4" H x 2 3/4" diameter, has bright translucent colors and retractable sipper spout with straw, and fits most vehicles or exercise machine cup holders. Not microwave or dishwasher safe. Silkscreen your logo on this curvy, eco-friendly container. 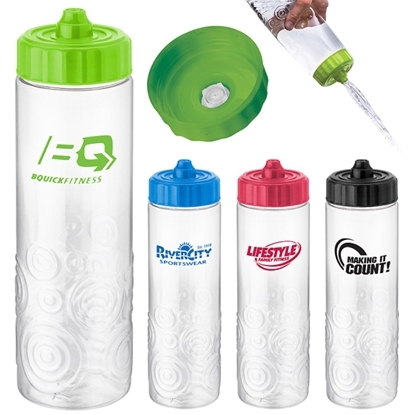 It's a great promotional product for athletic leagues, universities and community programs. 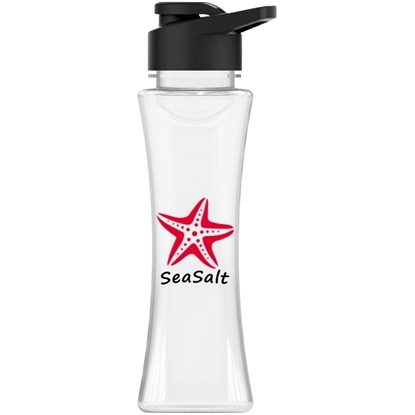 Promote a winning campaign with a lighter "grip" this season with our 28 oz. Long-n-Lean Easy Grip Bottle! 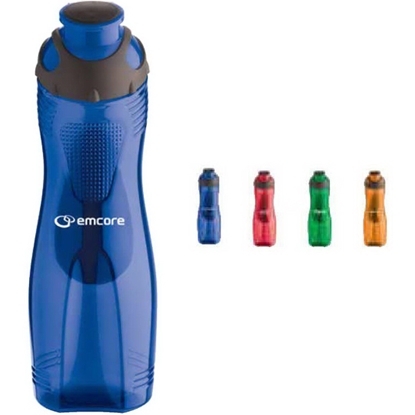 With the US design patent pending, this 10 1/4" H x 2 7/8" W, BPA-free, eco-friendly bottle features ribbed rubber back plastic panel, attached heavy-duty twist-on cap, and is stain and odor resistant. Not microwave or dishwasher safe. Have your logo silkscreened on this unique shape. Ideal for athletic leagues, universities and community programs. Your prospects and event attendees will love our new earth-friendly freebie! 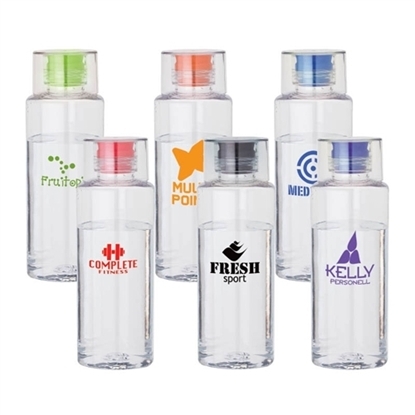 This 25 oz., BPA free, eco-friendly, single wall translucent Tritan (TM) infusion water bottle has a clever notch design for easy grip. 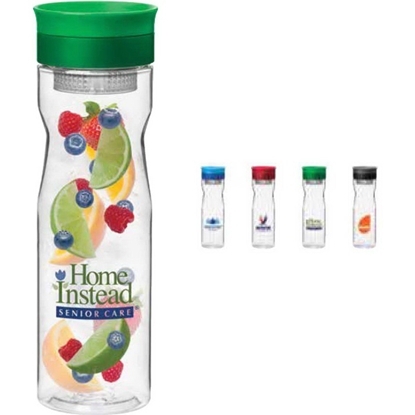 At 10 1/2" H x 3" D, this jug features bold color 2-tone twist-on lid with slide lock closure and fruit slice design on top. A clear fruit and tea strainer attaches under the lid, filtering your infused beverage. Twist for closure, not microwave or dishwasher safe. Ideal for trade shows, conventions and festivals. Circa Two water bottle. 21 oz. Tall and slim shatter-resistant. BPA free. 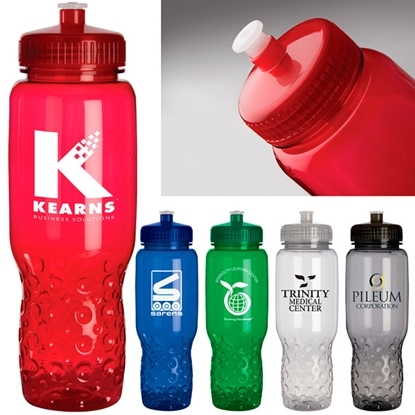 Single wall bold color Tritan (TM) material bottle base with matching color PP bottle top with twist-on lid with built-in loop. 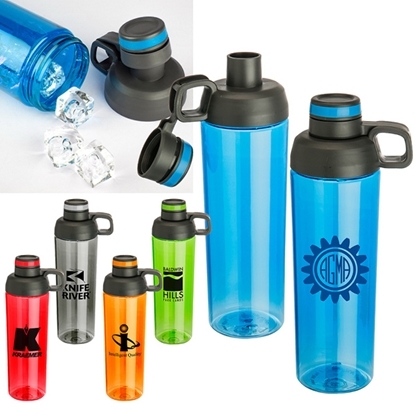 2 opening options: Top for drinking and mid bottle for ice or filling. Not microwave or dishwasher safe. Measures 10 1/4"h x 2 1/2" diameter. It's the quintessential summer water bottle! This 30 oz. 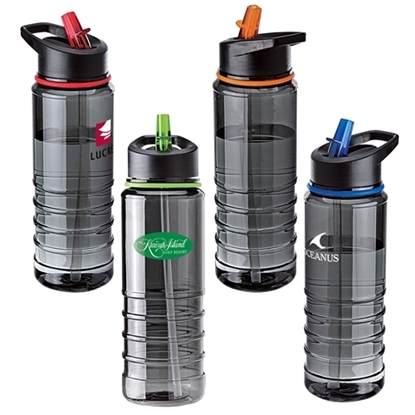 shatter-resistant Catalina Column Water Bottle is made of BPA-free, single wall bold color translucent Tritan(TM) material with clever notch design for easy grip. At 10 1/2" H x 3" diameter, it also features bold decorative stripes and twist-on plastic lid. Ideal for festivals and community programs. 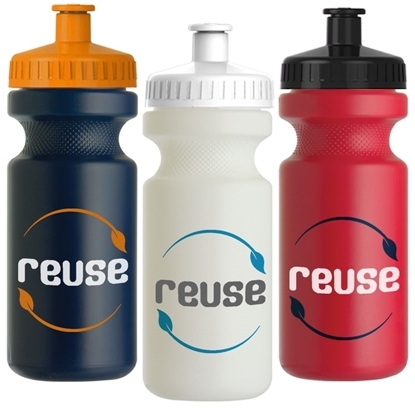 Your silkscreened logo displays brilliantly on this eco-friendly jug! Your prospects and event attendees will love our new earth-friendly freebie! 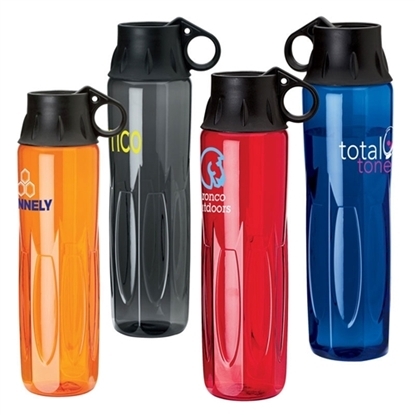 This 24 oz., eco-friendly, single wall translucent Tritan (TM) water bottle has a decorative texture body and is easy to squeeze. At 10 1/2" H x 3" diameter, this jug features 2-tone twist-on lid with Sure-Snap (TM) sport valve opening. Ideal for trade shows, conventions and festivals. Zuma Two-Opening Water Bottle. 30 Oz. 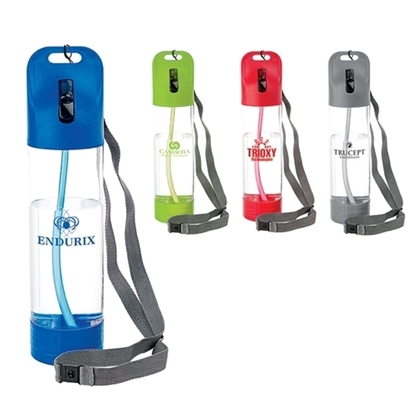 single-wall Tritan water bottle with attached spout cap lid. Spout cap threads internally for smooth-lipped sipping; or unscrew the full wide-mouthed cap for easy filling and gulping. 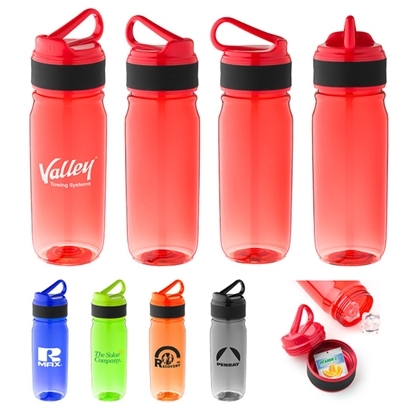 Durable and leak-proof with silicone gaskets in both caps. Single-walled, perfect for cold beverages. BPA-free, hand-wash only. 10-1/4" h x 2-3/4" dia. Features: 22 oz. Capacity. Durable Tritan Material. Drinking Spout. Wide Opening Screw Top for Easy Cleaning. Silicone Seal. BPA-Free. Drink smart with the Basecamp Metro 26 oz. 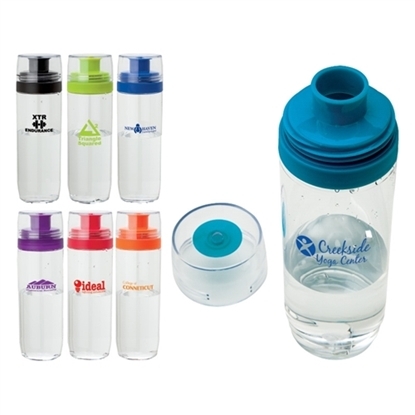 Water Bottle, BPA-free, impact, odor, and stain-resistant, Easy 1-handed flip top cap for easy drinking, Fits in most car and gym cup holders, Slip-free grip for easy hold, Wide mouth opening for easy filling, spillproof design. 9 1/2"H x 2 7/8" diameter. Features: 22 oz. Capacity. Durable Tritan Material. Polypropylene Lid & Base. Flip Down Sipper. Integrated Carry Handle. Matching Color Straw. Breakaway Neck Lanyard. BPA-Free. If you are a road warrior, you know that hydration is important to combat jet lag and travel fatigue. If you are a road warrior, you know that opening a fresh bottle of water each time you need a drink means creating a lot of plastic wastage in one journey. If you are a road warrior, you know that conventional round-shaped bottles do not fit easily in handbags, laptop bags, or the seat pockets of planes/trains automobiles that are usually designed to hold magazines. If you are a road warrior, you know that every inch of space matters in making your journey comfortable. 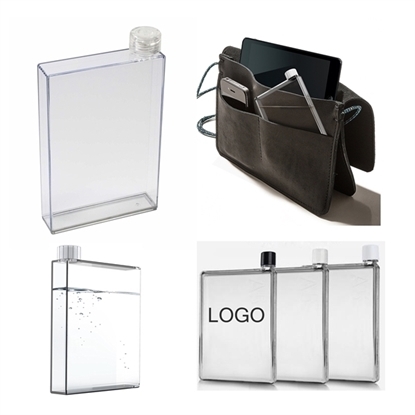 A simple solution to a basic problem -- It is a book-shaped flask made with durable BPA-free plastic and designed with curved edges to conveniently hold 16 oz of water that travels easily so you can too. 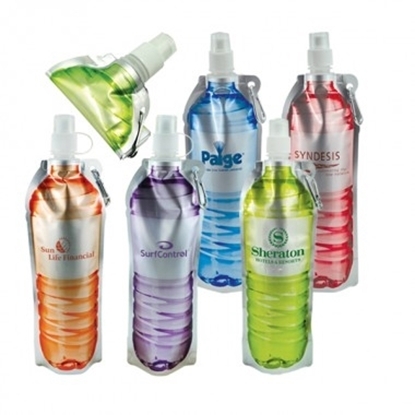 Mypromotionalpens.com offers the largest and best priced selection in Promotional Plastic Bottles. We will price compete and we won't be under sold. 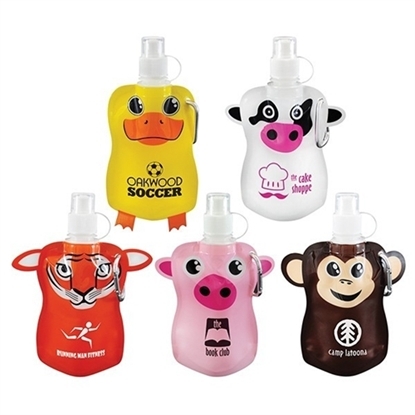 Let our graphic designers make your personalized Plastic Bottles standout above the crowd at no charge. We won't stop until you are completely satisfied with your custom Plastic Bottles art proof.Use category search filters on your left to help narrow your search to find exactly what you are looking for.